The Ark is Discovered, Just Inside Your Door! The first direction that Noah received for building the ark was that its length was to be 300 cubits. Its width was to be 50 cubits and its height was to be 30 cubits. The competition who has been trying to discover the real ark hasn’t found any debris with these precise dimensions. Up to a few hours ago, no one has found the true ark as far as I can see. I am not concerned at the moment about the ark’s dimensions. 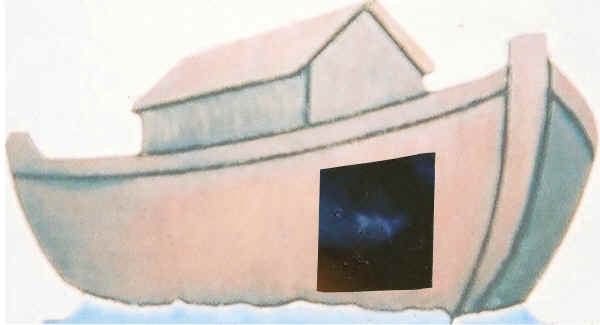 A window was made on the ark as well as a door. I don’t care how many cubits the ark was, nor do I care, at this point how much light the window let into the ark. My humble assessment is that the most important feature on the ark is nothing but its door! The door was three stories high because it was also used as a gang plank for the animals to enter the ark. I am not a building expert, but I’m sure the most important feature on the ark was that door! Noah could have run an ad inviting all the inhabitants of the earth to come and get on the ark with a parenthetical insertion telling them to bring their own rope and climbing gear but instead there was the door of the ark! Being three stories high, it was next to impossible for Noah and his family to lift that large and heavy duty door. When we follow God He always provides a solution to our situation, and in this case God shut the door, when no one else had the courage to enter this vessel of deliverance. Every species of animal certainly knew what the ark’s purpose was and thank the Lord, where to board. We don’t know how many swore to ignore the door. Noah was a man who preached the good news for a great portion of his lifetime and the people just mocked him. You may be someone who says, “So what!” This man told of a rain storm coming that would rise higher than the highest mountains, worldwide! The people just couldn’t imagine rain, because they only had learned of rain falling from the sky from the mouth of this seemingly crazy preacher, so they continued to deride Noah instead of riding in the ark. Even when the wild animals were supernaturally led by some invisible Spirit onto the ark, the masses of people failed to recognize that something had already changed enormously in every creature. But those who still appeared to be human beings insisted on giving Noah no heed, just as they had resisted their Creator’s preparation for them through Noah! Then, just like Noah warned, the rains came down and the floods came up! As I said, the door to the ark also served as an entrance ramp and it was likely too large and heavy for Noah to close. God does not honor disrespect and rejecting His counsel for any amount of time beyond His pre-established limits. He demonstrated this in another place about a woman to whom He gave space to repent, but she did not and would not repent. (See Revelation 2:21-23) Her children died and she was cast into great tribulation. Today, we are either extremely near the time the Bible calls the great tribulation or we are already in it. God always has a time for every purpose under Heaven. If we don’t use that time wisely, we chance perishing. Today, Jesus is saying that He wants to harvest you and me and us all into your place of rejoicing that He has prepared for us. We can refuse, we can mock and we can die. Or, we can get on board His new ark. His new ark is not only Jesus but Jesus said in John 10:7, “I am the door.” In John 10:9, Jesus says, “I am the door: by me if any human being enter in, he shall be saved.” Notice that the word human being is substituted for the word man because man is not what the Bible says from the original text. Pay attention to the fact that any human being is welcome. The animals are smart enough to know when great peril is before them and how to find safety. Some human beings are so ignorant that they don’t know a great gift when they are offered one. You will notice that Noah never sold passenger tickets. It’s a free gift! It doesn’t matter who you are, if you are a human being Christ has a purpose and a love for you. Some people believe that Satan and the angels who rebelled against God will still be saved. But God’s salvation is for all the animals and all the human beings who want to be rescued. The invitation excludes the fallen angels and Satan. God did not want those who were determined to ignore Him and reject Him to try to board the ark when they only wanted to get temporarily rescued but had no desire to do God’s will or to please Him. He knew who would speed aboard unnoticed, at the last moment, and be the first to leave the ark to celebrate their intimacy with the Evil One. God’s reaction was to close the door in the side of the ark. And the unexpected deluge began. Those who chose to follow God and to cooperate with God, survived and the rest were lost! As a mere human, that terror and perishing must have seemed traumatic, but we must stay focused on the reality that God is about giving Grace and Mercy to the humble, and resisting those who walk in unwillingness to repent! Most people don’t understand that God desires to have a relationship with us. He will transform our life, so it doesn’t matter where we started. Where we are going with our life is what God cares about. He can make us new creatures. All we must do is say, “Yes Lord,” and walk through the “door.” God’s promise is that He will let you in through all that Jesus is and has done. I think that I can withstand quite a bit, but when God recently showed me what those events would be based upon: His word, His Spirit, and the activity that is already manifesting here and abroad, I am trembling and I want to cry for you and to say, “Run to the door, it is not yet sealed. Jesus Christ, the Son of God gave His entire life to save you from the hour that is quickly coming. He made room for you in His very body, and will guide you with surety into safety and everlasting life, if you realize that today is the acceptable time for you to get on board with Christ Jesus the Lord!” He does not guarantee that we will not have to suffer to some degree, but He does promise He will allow you to suffer nothing which you are not able to endure. If you travel with Jesus as your partner, He has a Kingdom for you that will always keep you above the flood. The door is still open and the time is late.